What a nice surprise popped into my email today. I do not know this reviewer, nor this journal, but it sure is a nice way to start a new day. 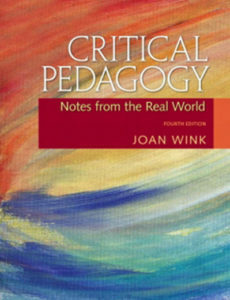 I very much appreciate Kyle LaPaglia’s review of Critical pedagogy: Notes from the real world (4th ed), which was just published in The Journal of Qualitative Research. I note that LaPaglia cites Longman as the publisher. Longman’s did publish the first edition, then Longman’s morphed into Addison Wesley, which morphed into Allyn & Bacon, which morphed into Pearson/Prentice Hall for the publication of the last edition. It was a confusing and bumpy ride of publishing during those years, and I wondered how my editors could even find their desks when they came to work in the morning–much less, their present publisher. LaPaglia’s book review is posted below. Click in the box below to see the Table of Contents and a few live links for your reading pleasure. The cheapest used copy of that book today is listed with Amazon for $61.91. Good grief–it is not that good. Pearson sells it for $73.91 today. Click here. Barnes and Noble often has used copies online for about $35. Alibri.com often has $20 to $25 copies. Some (thriftbooks.com and abebooks.com) used online book stores sell it for $5 to $10. And, Books-a-Million has them from $2.99.